Grummett & Timbo, all set to go! 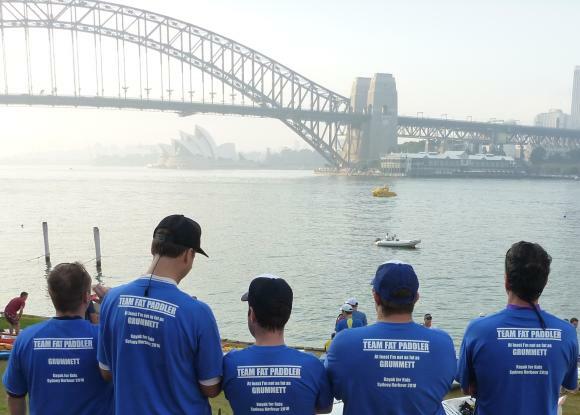 Arriving in the dark at 5.30am, Team Fat Paddler assembled what boats we had and all our gear before enjoying the breaking sunrise over Sydney Harbour. Like the Bridge to Beach, we had some logisitics to get through including car runs to The Spit so we wanted to get registered early to get things done with plenty of time. Of course it was only during this stage that Grummett understood what we’d done with the team tshirts. A few months back he’d given one of my children Play Dough for her birthday – a weapon of mass destruction in any home that parents will try to avoid at all costs. I had sworn that I’d seek revenge, and it was through the tshirts that I’d done so. Of course his shirt was simply customised on the back to say “GRUMMETT”, so when I’d given him his shirt the day before he was quietly relieved that I hadn’t done everything. 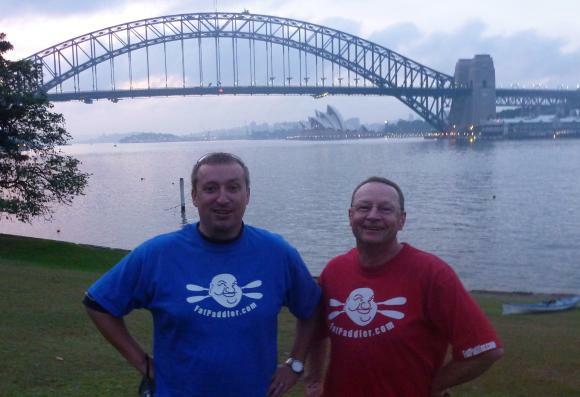 But as the sun came he realised what the REST of our tshirts said: “At least I’m not as fat as GRUMMETT”. Registering was easy and we spent a little time talking to the Lifestart organisers, predominantly about rugby which appeared to be a shared passion for us all. 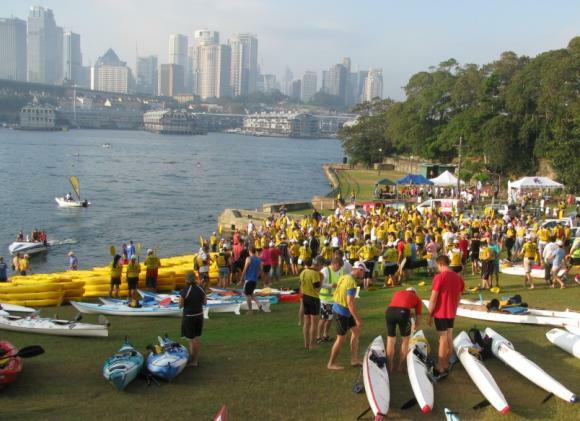 With coffee now being served and hundreds of paddlers gathering, the atmosphere started to build for what was looking to be a great event on a stunning Autumn day. 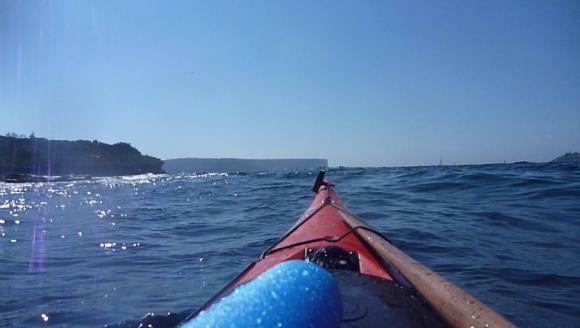 We made the dash to The Spit to drop cars off, had a quick chat to Shannon at Sydney Harbour Kayaks as he lashed kayaks behind his run-about for the trip to Blues Point, and then returned to Blues Point. Once back we simply had to wait for Shannon to arrive with his boats, where I filled the time by shooting paddlers with my water pistols. 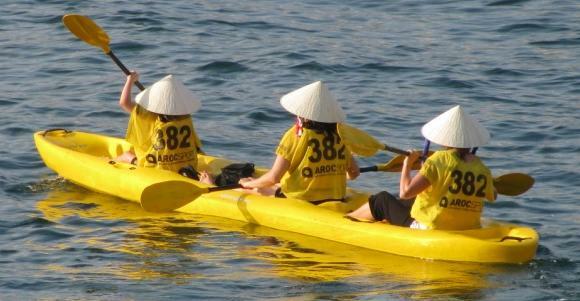 The first race-starters were teams in three-person yellow sit on top kayaks. There were 70 of them stacked on shore, so the task commenced to get them into the water. 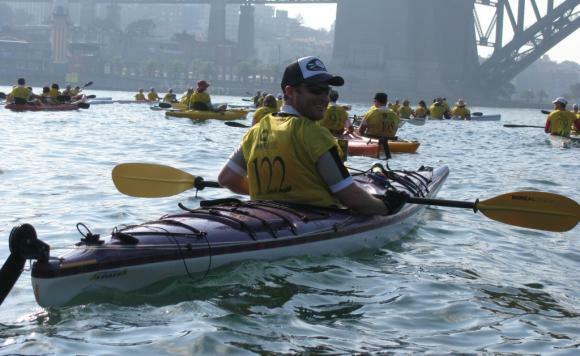 Once out, they lined up in front of the Sydney Harbour Bridge before their race started and they were on their way. With our start only a few minutes away, we had one simple problem. 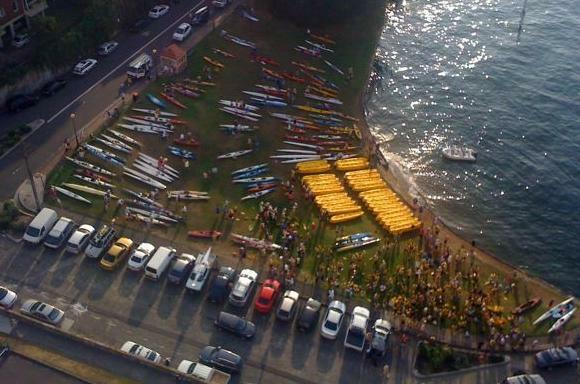 The boats from Sydney Harbour Kayaks hadn’t arrived, as Shannon had had trouble keeping them from being swamped by passing boat traffic wake as he towed them the 12km from the The Spit. Then with minutes to go he arrived, and after some quick organisation we finally lined up our boats at the start. FP waiting for the race to start. Terrible backdrop, eh? And then we were off! As the hundreds of paddles took off, the water churned around us like a giant washing machine, with ferry wake adding to the maelstrom. 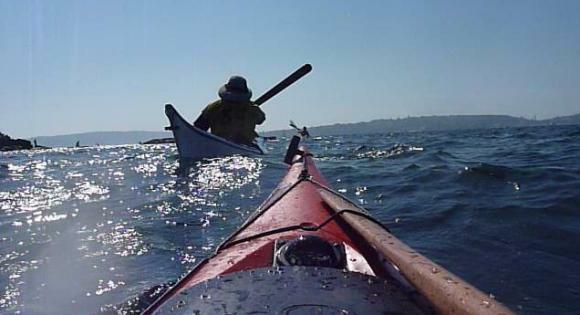 This was the first test for the paddlers, as the lumpy chaotic water threatened to tip boats over. For many of the novice ski paddlers, that’s exactly what happened, with half a dozen of them taking a swim under the Bridge. As we passed Kirribilli Point the water started to calm down, and we could enjoy the beautiful sunny morning on one of the world’s most stunning harbours. This was paddling nirvana, with sparkles on the water and the friendly banter of so many paddlers around you. Then the Team Fat Paddler started to separate, as the faster paddlers took off leaving the slower paddlers (ie me!) behind. With Alan, Grummett and Ned all at the front, Sacha cruised somewhere in the middle playing with his camera whilst Timbo and I brought up the back of the pack. Then gradually Timbo started to slip back, before I suddenly realised he was a good couple of hundred metres behind me. After a little while I was starting to worry that Tim was hurt, so I slowed right down and allowed him to catch up. When I asked him what was wrong, he replied that he was waiting for the rest of Team Fat Paddler to catch us up, so I had to explain to him whilst laughing that they were in fact all way ahead of us! Good one Timbo!! Tim now making up for lost time! For the next 5kms or so Tim and I paddled together behind the rest of TFP, who would occassionally wait for us for a quick hello before powering off again. We probably would of been a little faster had we not been having so much fun. Between chasing ferries to jump or surf their wake, to chasing other paddlers with our water pistols, to trying not to get too close to nudist beaches, there was way too much fun to be had to worry about things like race times! Eventually we started our approach to Middle Head, the toughest section of the race with it facing the ocean swell coming in off the Tasman Sea. Despite the weather reports, the sea looked decidedly lumpy as a good sized swell battered the cliffs off Middle Head. As we rounded the Head the criss-crossing swell and rebound started to throw our boats around, giving me a case of nerves as I struggled to keep the boat under control. Timbo of course loves these conditions and I swear I could hear him yelling with joy as he surfed the lumpy seas, zooming past me from time to time whilst racing down the front of passing swell. Of course I caught a few runs of my own, and as we surfed closer to the rocks and cliff of Middle Head, we hard the local coast guard boys yelling at us to stay away from the rocks. Despite our assertation that the rocks are where the most fun is to be had, they moved us away from them as we rounded the head into the gentle waters of Balmoral Beach. At Balmoral we found Sacha and Ned waiting for us and then as a team we paddled the last few kms to Clontarf Point, where we met up with Alan who finished a good half hour before us all. 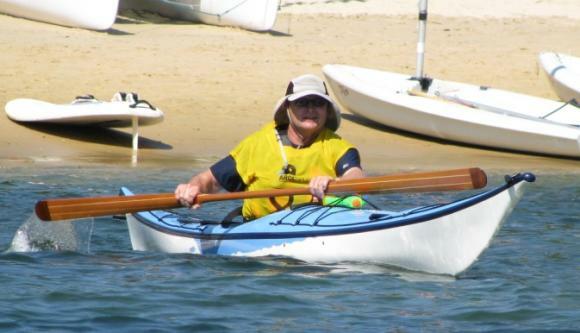 Then as a team we paddled into Clontarf Beach to finish. All that was left was to walk the final 20 metres to the finish line. 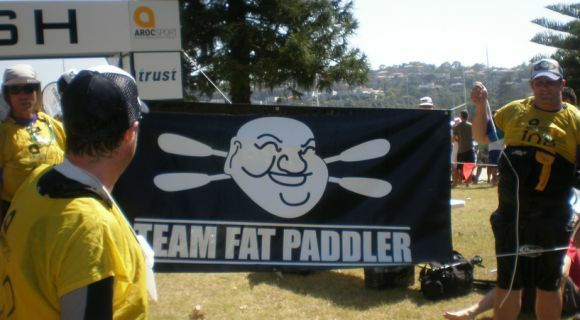 But before we did, I pulled out a 2 metre Team Fat Paddler banner for us to walk through for maximum impact, which we definitely got with Blast Paddler maestro Dez exclaiming “YOU CAN’T BE SERIOUS” as we came through the finish line. Just in case people weren't sure who just finished!! Waiting at the end were our respective partners and kids, and to our immediate joy, my wife had bbq’d up a big tray of sausages and hamburgers for us! 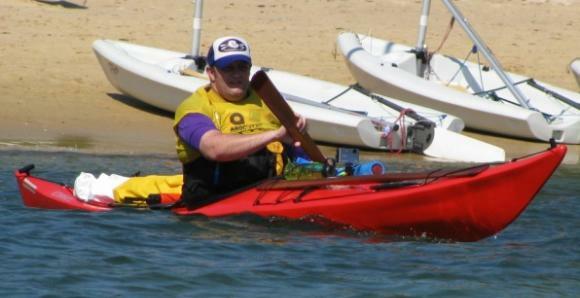 So will a belly full of sausee-sandwiches we ended our day, having thoroughly enjoyed the Kayak for Kids event. Of course, there was a “third half” that happened a bit later to celebrate, but I’ll leave those details out. Needless to say the only photo I have of that is this one…. 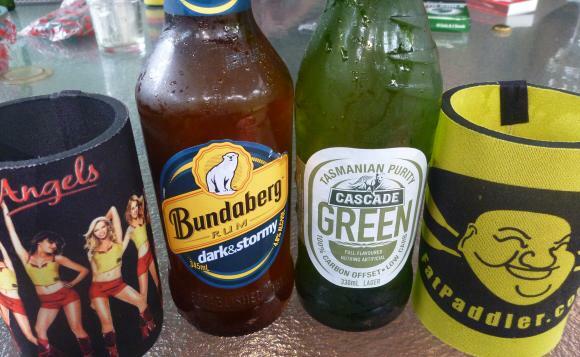 The FP cocktail - Bundy Rum & Ginger Beer, washed down with Cascade Green carbon-offset beer! An event like this despite being a bucket-load of fun is actually a really important fundraising event for the Lifestart charity, which does wonderful work helping children with Down Syndrome, Autism and other developmental issues. It’s important to remember some kids face enormous challenges growing up and it is through the help of organisations like Lifestart that they get the support they need. 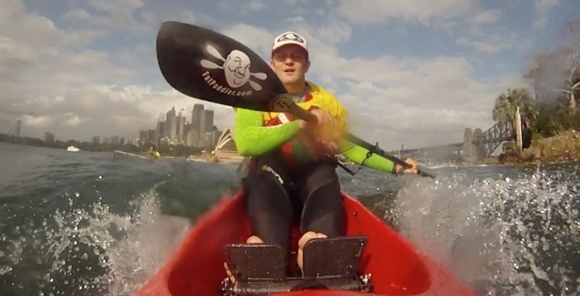 So on that note, you can still tip in some money for them via the Team Fat Paddler fundraising page, or you can support them directly through their own website. 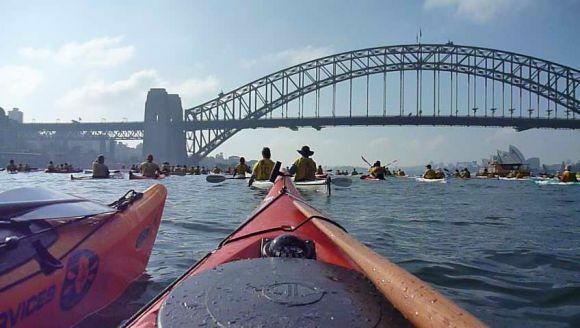 Sydney Harbour Kayaks. 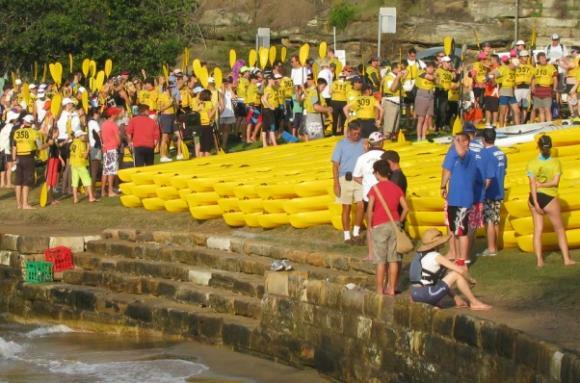 Kayak hire and sales at The Spit, Sydney. GSS Environmental. Environmental, land and project management consultants, based in Newcastle. Umwelt Environmental Consultants. Environmental consultancy based at Toronto. SubZero. Mining services company base in Muswellbrook. Stephenson Environmental Management. Air monitoring company based in Sydney. Global Acoustics. Environmental noise monitoring company, based in Newcastle. Gauge Industrial and Environmental. Industrial and chemical consultants with offices in Sydney and Brisbane. Pukara Estate. Olive oil producers form the Hunter Valley. Global Soil Systems. Disturbed land revegetation specialist, based in Newcastle. Database Gurus. Database specialists based in Austimer. Blast Paddlers. 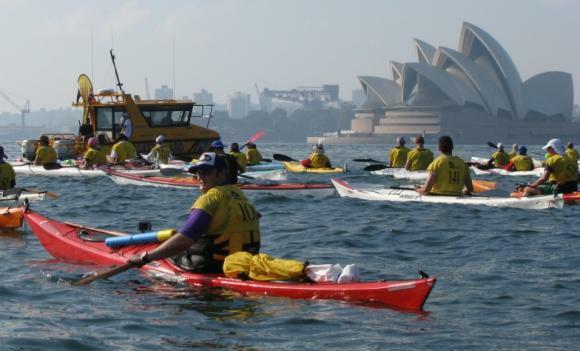 Ocean ski time trials and races in Australia and the world! 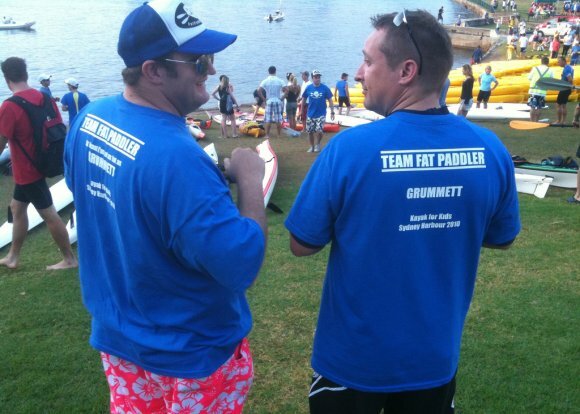 Thanks to everyone who donated from Team Fat Paddler! Fantastic blog FP. Thank you for all your support on the day. You looked as though you had a ball and I know that all the kids from Lifestart have benefitted from your generosity. I failed to pull my weight on the fund-raising and now I’ve failed to pull my weight on the blogging too, but big thanks to the sponsors and to LifeStart. 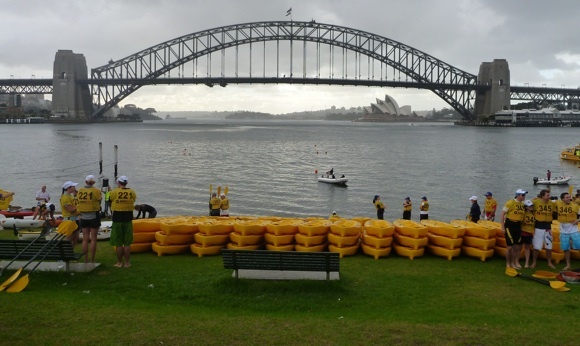 Extra special super thanks to Shannon from Sydney Harbour Kayaks who had an enormous struggle to deliver the kayaks for us and who supported us all the way through training and on the day. 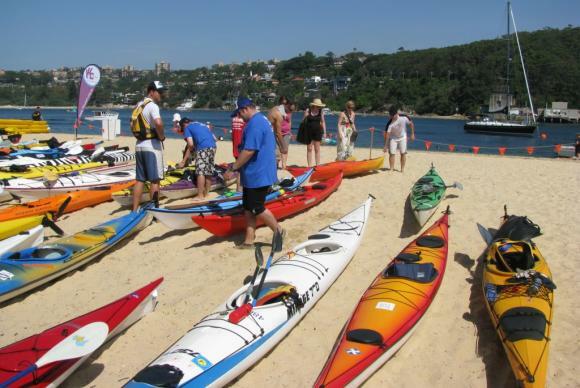 You really couldn’t pick a better place than Sydney Harbour Kayaks to rent or buy a kayak. Sounds like you had a ball. 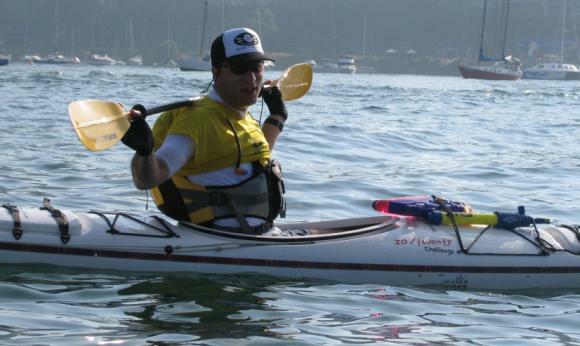 I am really up for entering the 2011 kids for kayak event – and will definately be in a sit-on as I don’t fancy capsizing! Can you post what the TFP total raised was (I couldn’t be bothered to add it all up just now) as it looks like you rasied heaps and heaps – congratulations! I can’t remember exactly but it was somewhere around the $7-8K mark from memory!